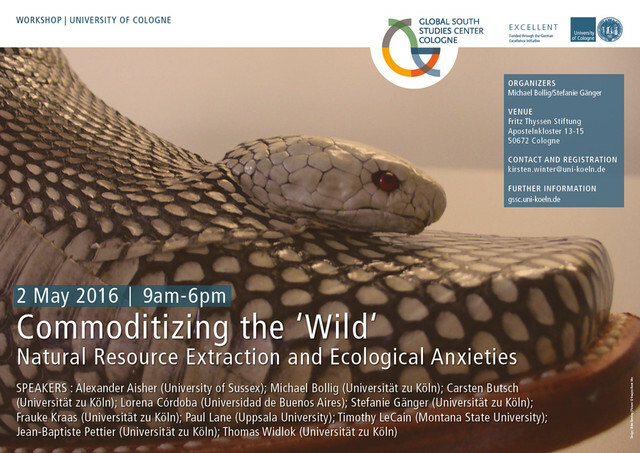 This workshop is concerned with discourses about the ecological consequences of the extraction of ‘wild’ fauna and flora for export trade – of humans clearing natural forests and hunting elephants, bears or lynx to extinction, but also of the introduction of new species and the massive artificial breeding or cultivation of existing ones for the purpose of feeding ‘wild’ natural commodities into global value chains. 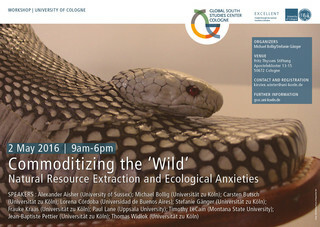 The workshop brings together papers that, while adopting a wide range of disciplinary perspectives – from anthropology, archaeology and history to geography –, share a spatial focus on chains coming out of Africa, South and Southeast Asia as well as South and Mesoamerica and the West of North America, the sites classically associated – at least in the ‘northern’ public vision – with ‘biodiversity’ and ‘the wild’, and still very much imagined in opposition to ‘civilization’, as ‘untouched’ nature. The various papers reassemble anxieties about the ecological consequences of the extraction of ‘wild’ commodities – convictions of forest loss, anxieties about the rapid advance of desertification, desiccation and land degradation, as well as more recent concerns with climate change and alterations or declines in biodiversity and species loss – and situate these senses of ecological urgency and endangerment, as well as the values implicit in them, in historical and anthropological perspective. Focusing on the period generally referred to as the ‘anthropocene’ – the centuries spanning from the beginning of the Industrial Revolution to our present, during which human beings are generally thought to have become a major geological force – contributions both ascertain and interrogate assumptions of human primacy: drawing on theoretical approaches that dramatize the agency of non-human actors – theories from actor-network theory to the ‘ontological turn’ that reconceptualise the relationship between the human and non-human as symmetric, symbiotic and dissoluble – they also revisit the capacity of ‘the commoditized’, i.e. plants and animals, to act and affect commodity chains and natural resource extraction.